If you ever head east out of Portland on Interstate 84, be on the lookout when you reach the hills of eastern Oregon, around mile marker 335 near the Burnt Creek exit, you’ll see this picture. Take a close look. What do you see? What’s wrong with the picture? Now ask a different question about the same picture. What’s right with the picture? 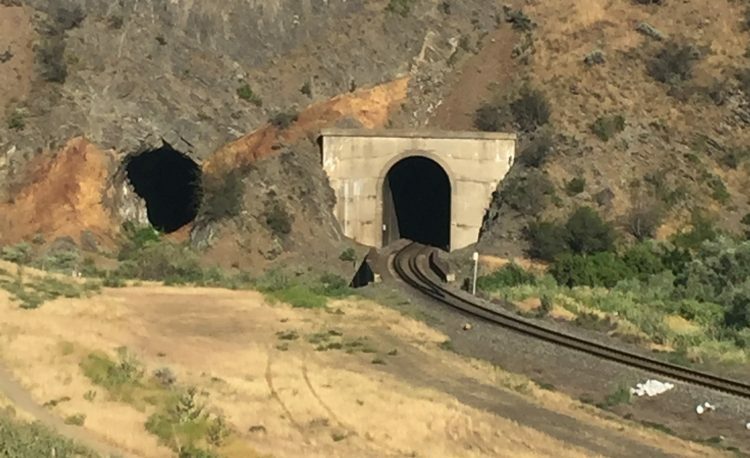 There are two tunnels side by side. 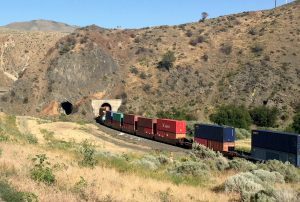 Back in 1928 the railroad began to dig a tunnel through the side of the mountain (long before the freeway was built). Several months into the project they abandoned their original tunneling effort and started over, completing the tunnel on the right in 1929. That tunnel is still in use today. Each time I drive this stretch of road I wonder about the story of the two tunnels, one unfinished, one finished. I wish I could have been there to hear the conversation. Who was the first person to realize their calculations were off, or the stone lacked the structural integrity to stand the test of time? Who had to be convinced that their original plans for digging a tunnel were not going to work? How high up the railroad hierarchy did the people in charge of the project have to go to get approval to abandon the original plan and make new plans? Back on the job site, how was the news received that work on the project was going to stop, and a new project, 75 feet to the south, was going to take its place? This picture and these circumstances provide a great metaphor for organizations and their leaders to consider. It helps us articulate essential maxims about organizational culture, strategic plans, the capacity to execute and the ability to navigate change. Here are seven principles to guide planning, execution and change. 1. Develop and adopt a plan, then resource, implement and execute the plan. It sounds so basic, so obvious, but too often we see organizations talk about their future, plan for their future, then fail to determine how they will redeploy the necessary resources (personnel, financial, physical) to achieve their future. Effective organizations declare their intent; they exercise the corporate will to implement a new plan, and then they go out and do it. Without execution, talk of implementation is merely the rhetoric of good intentions. Execution is essential for success. 2. Be prepared to make changes to the plan. 3. Develop a culture that anticipates and embraces change. Your ability to expect change and adapt to change says a great deal about the health of your organization. A single plan is a good beginning; a core plan with well-reasoned contingencies is better. Christensen addresses this multi-dimensional approach and posture of planning. “The best strategy is a balance between having a deliberate one, and a flexible, or emergent strategy.” We should not panic when change is necessary, we should not hunker down in a state of institutional denial, we should consider the scenarios we have developed and modify our plans. 4. Invite and assess input from inside and outside the organization regarding your plans and performance. How do we know it’s time to change? When do you stop digging one tunnel and decide where to dig next? If we are committed to developing a culture that anticipates and embraces change then we must regularly engage internal and external stakeholders, inviting their input regarding our plans, our product and our performance. Implementing plans isn’t enough. We must routinely track data, receive input and monitor progress. A commitment to learn, modify and improve is a sign of a healthy change-culture. 5. Always scan the environment, anticipate factors that may disrupt your plans. 6. When disruptive innovation occurs assess its affect on your plans, determine the best-revised approach, repeat #1. Sometimes it becomes clear, we need to stop digging the tunnel. Disruptive conditions are upon us. When it’s clear disruption is here, what should you do? Step one, assess. Run the numbers, do the research. Is the disruption a threat to your core line of service, does it reduce your margins? Consider your mission and vision. Can you use the disruption as an inflexion point to examine, add, discard, modify or differentiate what you do and how you do it? Don’t panic, research, assess, plan, and then re-launch your modified plan, anticipating more change as you go. 7. When possible, devote appropriate resources to discover where you can be a disruptive innovator. Healthy organizations exercise the institutional will to set aside enough resources to discover where they might be able to offer services and products their competitors don’t offer to a whole new set of clients they don’t currently serve. Does your organization devote time, energy and talent to explore new markets, new solutions? Do you have the institutional fortitude to launch such a plan? We must encourage creative thinking; it may one day create new demand for a new service. Take a look at a second picture. In order to successfully achieve their goal, they had to abandon the original plan, lay a new plan and dig a new tunnel.